A user guide, reference book and two-day training course written for Project Management Professionals who wish to learn how to plan and control both an unresourced and resourced project in an established Oracle Primavera “Enterprise Project Portfolio Management” environment. 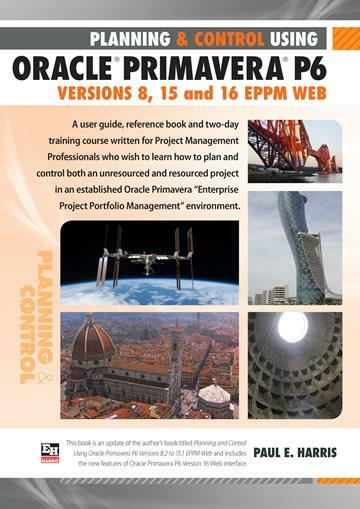 This book is an update of the author’s Planning and Control Using Primavera P6 Version 15.1 EPPM Web and includes the new features of Oracle Primavera P6 Version 16.1 Web. It covers the Primavera Versions 8, 15 and 16 EPPM Web tool. It explains some of the differences from the Professional tool, SureTrak, P3, Microsoft Project and Asta Powerproject to assist people converting form other products. Paul Harris holds an Honours Degree in Civil Engineering obtained in the UK and is a Certified Cost Engineer through AACEI International, a PRINCE2 Registered Practitioner and a “Managing Successful Programmes” Registered Practitioner. He has worked in the project controls industry for a number of years and has assisted many companies in a range of industries to set up and run project controls systems. His Melbourne, Australia based company, Eastwood Harris Pty Ltd, offers project controls consulting and training services worldwide with a strong focus on Microsoft Project and Primavera software.